The history of Dry Needling (DN) dates back to the 1940’s with Dr. Janet Travell. She identified the muscular trigger points and referral patterns that were elicited with the “wet needling.” Later, she discovered that “Dry Needling” offered the same results. This was groundbreaking work and hence she created the name “Dry Needling.” She and Dr. David Simon carefully identified most of the trigger points located in the human body. Thus, the first generation of modern Dry Needling was established. The practice of Dry Needling has been around for decades and continues to improve Neuro-Musculo-Skeletal function. As these techniques, methods improve, so do the practitioner's skill set, making this treatment strategy one of the most effective in the world of rehabilitation. 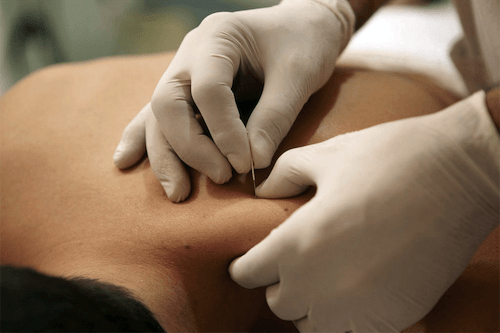 The primary goal of Dry Needling is to desensitize supersensitive structures, to restore motion and function and to possibly induce a healing response to the tissue. For seasoned practitioners, Dry Needling is extremely beneficial for quick and tangible results on top of other movement remediations. Musculoskeletal diseases affect more than one out of every two persons in the United States age 18 and over, and nearly three out of four age 65 and over. Trauma, back pain, and arthritis are the three most common musculoskeletal conditions reported, and for which health care visits to physicians’ offices, emergency departments, and hospitals occur each year. This increase in occurrence of musculoskeletal pain is causing people to search for good manual therapists with a plethora of modalities, including Dry Needling, to fix their pain quickly.